For the best-value diving to Thailand’s best dive sites, there is very little to be beat Blue Dolphin, a new triple-engine speedboat operating out of Khao Lak. Not only are the prices among the lowest, the time to reach each of the best dive sites in Thailand is also almost unbeatable. Blue Dolphin is far from ‘no frills,’ though. It’s just that some people just want to get out to the Similan Islands, Koh Bon, Koh Tachai or Richelieu Rock and do no more than dive, and that’s it. Pick up from local hotels and resorts, plus lunch and drinking water are included in the price, and the high-quality diving equipment rental prices are among the lowest for Similan diving. However, it’s not just about high speed and low cost. Blue Dolphin is a new speedboat that is capable of transporting up to 17 divers in comfortable safety. The three 225 hp four-stroke motors ensure reliable, odour-free, and quiet performance every day of the week. Many of our guests choose to dive on multiple days from Blue Dolphin, simply because the boat visits different spots one day after the other. This includes three days per week at Thailand’s best dive site, Richelieu Rock, two days at the Similan Islands, a day at Koh Bon, and every Monday at Koh Tachai & Koh Bon. For trips to Richelieu Rock, you need to have dived within 6 months. From October 2018, new regulations require us to collect passport information for every guest at the time of booking. This is to buy your Marine Park entry ticket. It cannot be bought less than 48 hours before the trip, and sometimes takes several days. Each day's itinerary is very similar, with only the location of the dive sites different from one day to the next. Guests are picked up from Khao Lak hotels and resorts from 7.30am to 8.45am, depending on the location of the pick up. Hotels to north of Khao Lak get picked up last and dropped off first after the trip, and therefore these guests spend less time travelling. Transfers from Phuket are not possible. In fact, even guests who want to come by themselves from Phuket are advised not to. Staying in Khao Lak is the only reaslistic option. A light breakfast (coffee & snacks) is served before departure. At the end of the day guests are dropped off at their chosen location in Khao Lak. click below for more details of your chosen trip. Taking part in a diving course at the Similan Islands is the best place to advance your diving level, or even learn to dive in Thailand. Blue Dolphin is a clean, fast, stable and new speedboat which can transport divers and snorkellers out to Thailand’s best diving sites. Prices are inclusive of materials, equipment, National Marine Park fees, local hotel pick up and food & drinks throughout the day. 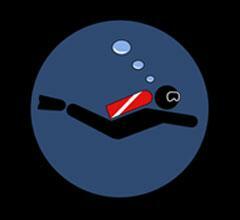 *Open Water diving students need to complete what is known as ‘confined water’ sessions before diving in the open sea. These sessions take place in a pool, or sometimes on a calm & shallow beach. The confined sessions are to learn and practice basic diving skills such as maintaining buoyancy and understanding commands, but without distractions of waves, depth or water currents. At any time, the students can stand up out of the water and talk to their instructor. These confined water sessions are part of both PADI & SSI courses and give the divers more confidence to enjoy longer and safer dives in the sea. ** Some dive sites such as Richelieu Rock are deep submerged pinnacles, and therefore unsuitable for novice or new divers. Not only are the depths of the reef deeper than new divers can reach, there are usually water currents which increase air consumption and shorten dives. Ideally, divers check in the day before a day trip to finalise payment and process paperwork and equipment fitting, but this is not always necessary. In the morning guests are collected from local hotels and resorts and taken directly to the pier. After each diving day trip, they are returned to their hotel, resort or other chosen location. If you are diving from Khao Lak, Thailand I have only five words to say about Blue Dolphin- don't hesitate, just book it. Bad weather bud still well organized and recommended. Awesome time. Neal was great. We're not super experienced and Neal made sure that we felt comfortable. Overall had a great experience. Plus free Ritz. Thank you! I had a great experience diving with this crew. Prices include Divemaster guides, weights & belts, 12 litre tanks, lunch, fruit & water. New regulations for National Marine Park visitors means that everyone has to provide their passport details (a clear scan is best) so that we can buy your entry ticket. Due to limited supply of park entry tickets, this needs to be done as soon as possible. Weekends, holidays, & local logistics mean that it is often impossible to buy your ticket 1-2 days before your trip. We need as much time as possible. Divers needing to rental scuba equipment can do so for just 500 THB for a full set.